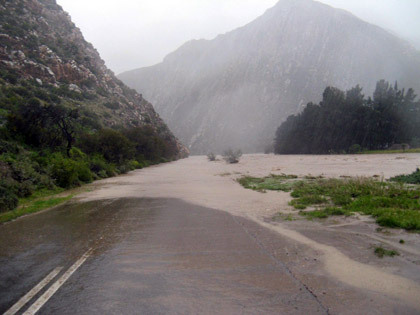 Heavy rains have once again caused flooding in certain parts of Montagu, limiting access in and out of town. More rain is forecast for Montagu on Saturday, 11 August 2012. You can monitor Montagu's weather yourself by visiting http://www.yr.no/place/South_Africa/Western_Cape/Montagu/. Please refer to the Langeberg Municipality Facebook page for updates on road closures. Some of the Montaguers who were brave enough to venture out despite the relentless downpours and icy cold temperatures, were seen "scurrelling" about with cameras or cellphones in hand taking photographs wherever they went. Most first rushed to the bridge to Montagu West to see if the newest addition was still intact! To see photos taken by some of our locals of the rainfall and flooding, see our "Rivers in flood once more" photo gallery. Drive safely and stay warm!